Here’s some nostalgia for our long-time members and a bit of history for the rest. This was Steve Flach’s sixth “dual sport” article that was published(?) in the CCC’s Great Lakes Trail Rider magazine back in 2003. It’s interesting to watch the “tone” change from year to year in the subsequent articles as things progress. Those of us with direct involvement can also look back on the history of our organization/sport and see things coming together (in hindsight, of course). The 2002 riding season has now ended and it is time for my annual dual sport report on this past season’s happenings. i am sad to say there were few highs in c.C.C. Dual sport this past year. The main downer is what most of you dual sporters already know about. This was my being diagnosed with lung cancer in late march, the treatment for it in the hospital, and my long recovery which has lasted up to the present. The following part of this article will give all of you more information about what I went thru. Was told later in the year that I almost died twice while initially being treated for this in the hospital during the last half of april. I have no recolection of what went on there during the first nine days. I was finally released to go home at the end of april and rehospitalized twice more in the first three weeks of may, once for pneumonia and once for a lower leg infection. I then spent another period in the hospital in early july for a blood clot, this being in the same right leg I had the infection in earlier in may. Chemotheropy treatments to battle the cancer started in late may and I had six sessions once every three weeks. The last chemo treatment was in august and on the day after labor day, my cancer doctor informed me that the weekely tests indicated the cancer was gone and I did not need the final two sessions, which I was very glad not to have to experience. Those of you reading this that have never gone thru chemotheropy, count your blessings. Since the last chemo treatment, my health has slowly improved, but I am still experiencing ‘side effects’ from these sessions. I have been told these will gradually end in time as my body slowly gets rid of the chemicals put in me during treatment. Just recently I was given the go ahead to return to my job on a limited part-time basis. These four hour a day periods are quite taxing and leave me quite tired by the time I drive home. I expect this to improve as the winter progresses. I have experienced two other downers since early july that may be related to the chemo treatment. My eye doctor told me in mid-july that I may have suffered a small stroke behfnd my right eye in tke optic nerve resulting in a slight loss of vision to the lower 40% of my vision in that eye. This has improved somewhat since and is more of a nusance that anything else. But around october 1st, I was told that the same thing may have occured in my left eye and this loss of vision is more extensive. I am keeping a positive aspect about these vision problems and hope they improve by themselves so I can get back to cycle riding and doing dual sport work in 2003. Not being able to ride at all this past year was very frustrating for me and ment all the dual sport work had to fall on my three assistants; Jeramey valley, shannon ruthrauff, and jim carl. i want to deeply thank everyone in the c.C.C. who expressed their concern about my health this past year. This included those individuals who sent me get well cards, made long distance phone calls to inquire about how I was doing, personally came from home (some a long distance, to visit me, and made monetary donations. This money I recieved from those who donated was most welcome in helping me keep ahead of paying some of my medical bills that my health insurance would not cover. Much thanks to everyone who expressed their concern in one or more of the above manners. Now for the ‘meat’ of this report. I would have to say c.C.C. Dual sport experienced a ‘downer’ year in relation to 2001. We had more overall dual sport signups in 2002, but we also had more trail tour events with dual sport than in 2001 to bolster this total. By individual event, dual sport signup totals were down at every t.T. In 2002 that had had an event in 2001 at the same site but one. . The biggest signup decrease came at the first event, capitol chapter,s ‘rites of spring’ t.T. Held at whiskey creek in early may. For the second year in a row about 800 riders showed up, but dual sport signups fell off by almost 25% from a year ago, going from an event record 128 in 2001 to just 97 in 2002. I was really disappointed when Jeramey told me this fact. I had expected a record dual sport turnout of close to 150 for this first 2002 event and I still do not know why there was such a large dropoff. 2002,S second event, the orv safety patrol t.T. Staged at south branch in mid-may saw the largest decrease in overall signups, going from 219 in 2001 to just 104 in 2002. Dual sport participation fell off from 39 to 25 for the same period. I was informed the weather at the t.T. Site that weekend probably played a large factor in this as it was quite cold and snowed one day. The next t.T. Up, the combined pathfinders- west michigan chapter’s annual event, was held at carrieville in early june. After having 307 overall signups, including 40 on the dual sport course, at their 2001 color tour t.T., These numbers fell off dramatically to just over 100 riders and 0 (zilch], dual sporters in 2002. These chapters decided not to have dual sport included in their 2002 t.T. The tri-county chapter came back from havi, an annual event in the u.P. The past five years to stage their 2002 t.T. In mid-june at the mio-hunt creek loop just north of mio. This proved to another signup ‘downer’ as just over 100 riders showed up with 36 on the dual sport course. This compared with 175 overall riders and 37 dual sporters at the brevort site in 2001. Another huge disappointment came with tomahawk chapter’s late june t.T. At wolverine. This annual event at this site usually draws well over 200 riders and either the second or third best dual sport signup total at the trail tours. Overall rider signups fell from 244 in 2001 to 197 in 2002 and dual sport participation went from 73 to 52. Finally some good news. The dual sport ranks got a boost in early august when the valley trail riders staged a t.T. At their club grounds near bently after an absence of several years. They had a good overall turnout of 192 riders of which 42 were on the dual sport course. This was a brand new dual sport course that was made up by my chief assistant, Jeramey valley. I analyzed what he had put together from my knowledge of that area and I have to say he did an excellent job considering it was his first dual sport course from scratch. The next event up for 2002 was the bulldog chapter’s annual t.T. In early september just north of atlanta. This was the lone event of 2002 to have both an increase in both overall signups and dual sport riders. The numbers were 243 total riders compared with 225 in 2001 and dual sport totals went from 50 to 54 riders. Capitol chapter’s ‘vintage’ ride in late september was next up on the schedule and was held for the first time at frederic just northwest of grayling. They had a good overall turnout of 241 riders compared with 205 in 2001. But dual sport totals fell off from 64 a year ago to 58 in 2002. The 2002 color tour was put on by the bentwheels chapter on the north end of black lake after a one year’s absense at the same site in 2000. Better weather this time compared with 2000 boosted total srgnups to 380, 40 more that in 2002. But dual sport signups did not match the 2000 totals, dropping from 71 to 59. The season ending dual sport only event held in late october at st. Helens added another 46 dual sport riders to the overall yearly total. Six trail tour events in 2002 produced dual sport signup percentages compared with overall signup totals of over 22%, but just one, the tri-county event, went over 30%. So, dual sporters, this was dual sport in 2002 for the c.C.C. Total signups increased to 469, an increase of 38 over 2001j so I am encouraged somewhat by this. Recieved various comments for the decline in dual sport signups at the 2002 trail events. The major ones were the weather, the economy, and some thought my absen,f due to my health was another. This part of the article gives much needed recognition to the people who took over for me and kept dual sport ‘happening’ at the c.C.C. Events in 2002. At the top of the list was my chief assistant, Jeramey valley. Jeramey really dived into doing the work necessary to construct a dual sport route for a tour event. For those of you that do not ride dual sport, here is what is required for a finished course to be ready. Jeramey had to travel up north to these sites each weekend and ride the rough routes I gave him that I concocted from memory, record the turns and millage, eliminate the dead ends, use a g.P.S. To record the true track of the course for the dual sport map, work signup each morning of the event to dispense the paperwork he made up at home in his off hours during the week after work, riding sweep on the routes sunday after signup was over, and deal with the state and federal d.N.R. Offices in the t.T. Site areas to get permission for the dual sport courses. Jeramey showed a capacity to learn this work very quickly and became quite good at it by the end of the season. His most important contribution to this work came with the paperwork end, which those of you who rode t.T. dual sport in 2002 noticed a new format with the route sheet strips and maps. Last winter Jeramey was able to invent a way to copy the route sheet instructions on 2, inch strips using his computer equipment. This new-fangled way saved me a ton of time and effort from doing this the old way, which ment tapeing t,e strips together. Jeramey’s equipment also produced very nice course maps in color. Both these jnovations were well recieved by the riders. Also this new way of manufacturing the dual sport paperwork turned out to be cheaper and ment the various chapters saved money in re-imbursment costs. I would strongly suggest all you dual sporters who rode last year to let Jeramey know how well you liked this new style of paperwork. You can do this by contacting ,im this winter by e-mail, post card, telephone, or when you see him in 2003. Second on the list for dual sport recognition was shannon ruthrauff. Shannon spent a lot of time last spring, summer, and fall either riding with Jeramey and help construct the routes or riding by himself during the week doing the same thing. I am hopeing he will continue with this for 2003. My third assistant, jim carl, was involved with higher priorities at home, but still helped out with some scouting work and made up the short loop at the color tour at black lake. 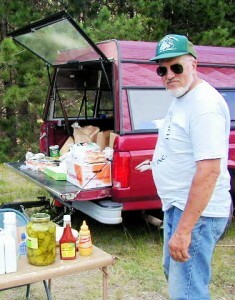 Larry and denny haas also lent their time accompaning Jeramey with his weekend work. Bern bidinger did a lot of sweep riding at the events along with shannon ruthrauff. If there were any other dual sport members who Jeramey employed to help him in 2002, your assistance was appreciated. There will not be many changes in dual sport for the 2003 season. The one major change was the formation of a separate dual sport chapter in the c.C.C. By Jeramey valley and r. J.Witte. This chapter will have the responsibility to concoct dual sport courses for those chapters that do not want to do the work themselves. This new chapter will probably not be putting on any dual sport only events. Although I would very much like to see this type of trail tour (dual sport riders only!,, It takes well over 100 rider signups at an event just to break even with the cost of permits and other expenses. We dual sport ranks do not yet have these numbers, but we are working on it. Other small changes for dual sport in 2003 will be just one set of millage readings on the route sheet instruction strips. This will be the ico electronic millage, which is the most accurate. Sweep riding on sunday will be curtailed, unless someone wants to contribute their time after signup to do this. As there are no longer any marking arrows or ribbons on the dual sport courses after the 2001 riding season, continue to pay close attention to your instructions and odometer. Route sheet holders will continue to be offered for sale at t.T. Signup and the larger print on the route sheet strips will continue. There may also be some single track trail offered on dual sport in the future (if we can find some smooth sections,. I use this part of my report to annualy appeal to those of you that are another year older and may be finally getting tired of single track riding and the miles of ‘whoops’ associated with it that make you feel 25 years older for the next week to 10 days and those of you that want an easier and/or different type of trail tour experience. Dual sport is still around waiting for you to try it. As usual, this final part of my report is the most important. All dual sport riders and their motorcycles must be road legal. For you riders, this means a cycle endorsement on your drivers license and copies of your cycle insurance and registration in your wallet. Your cycle must be equiped with the following: working horn, at least one rear view mirror, operating head, tail, and brake lights, united states forestry approved muffler/spark assistor with a 94 db. Or lower sound rating, d.O.T. Approved off-road tires, current licnese plate, and a current ory sticker por t8£ posted trail sections. As for you un-licensed two wheel, quad, or three wheeler riders, forget about the dual sport courses. If you choose to sneak out and try to ride these routes, then you are violating the law and if caught can get the c.C.C. And dual sport in trouble, which is something we do not need. With the 2003 riding season starting in a few months, I hope there will be better dual sport turnouts at the events than in 2002. I would like to see more ‘newbys’ come out and try dual sport. If all you experienced riders were to get just one new dual sporter to join our ranks, then we would be close to attaining the numbers needed to host a dual sport only event in the future. I thought in 2001 about trying to enlist mountain bike riders into the dual sport ranks, but was told by one of these people that the most experienced bike riders would need about six hours just to ride a short 50 mile loop, so I dropped this idea. And as I did last year, I appeal to you women c.C.C. Members that want to ride but do not like the single track trail to come out and join the dual sport ranks. You would not have to ride the longer routes as there are shorter options of 50-70 miles available. That’s it for the 2002 dual sport report. If my health improves enough by next spring) i hope to see all of you in 2003 as i try to get back into my dual sport work.